After Brexit and Trump, it is becoming clear that the Netherlands will not be the next domino to fall to populism. Wilders is slipping in the polls. This is not because the Dutch are inherently milder, but because they employ an electoral system that permits voters to be nuanced. Western liberal democracies with majority systems and proponents of referendums should take note. In explaining Trump’s election, many have blamed his deeply flawed and unpopular rival, and an increasingly partisan post-truth media landscape. Another prime suspect is social media algorithms that maximize user attention by serving up a news diet confirming existing biases, thus insulating voters from divergent opinions. Some critics have focused on the electoral process, though this discussion has mostly been limited to the disparity between electoral college seats and the popular vote. There is a deeper question nobody seems to be asking however: How did the political landscape end up so polarized in the first place? A majority system rigged to perpetuate the predominance of just two political parties plays a big role. 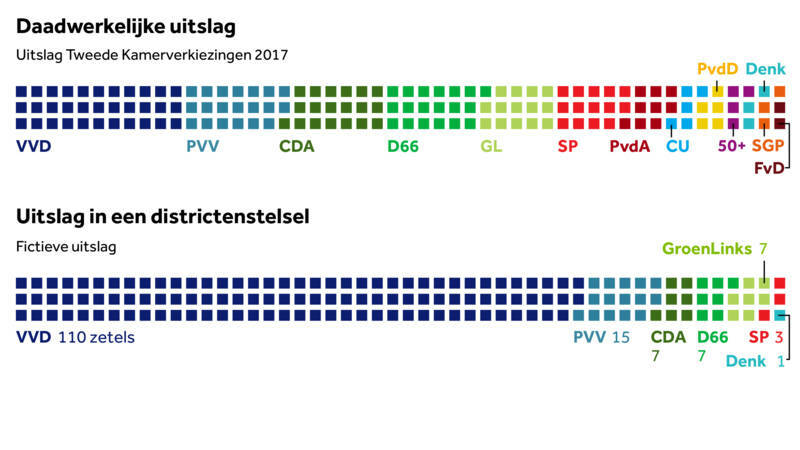 In Dutch elections, the entire country is treated as a single constituency with all parliamentary seats allocated in proportion to the share of votes received. Thus, a vote for a minority party with no chance of winning the plurality is not a wasted vote, as this party will get real influence barring it crosses the threshold of 0.67% (1 out of 150 seats). The result is that real political power is shared between about half a dozen parties with another half a dozen very small parties still having their voice heard. Since no party could ever hope to achieve an outright majority, coalition government forces major parties to be pragmatic, consensus-driven, and gives smaller parties real opportunity to impact policy. Let’s consider two examples of these principles in action: Strictly Orthodox Christians are consistently represented in parliament by a party with 2 to 3 seats in parliament, and have through bargaining managed to have real influence on policy during the last 4 years. Similarly, there is a small but vocal animal rights party that has successfully put animal abuse in factory farming on the political agenda. Several of the larger parties today started out as narrow political movements which gained legitimacy and moved to the mainstream over time. As such, dissenting opinion is represented and has a legitimate chance of being heard. Having so many political platforms to choose from makes a populist revolution much less likely in a proportionally representative system. Wilders’ Freedom Party has not been shut out of parliament but has been a part of it for well over a decade; though international media attention might have you believe this is somehow a new development. Prolonged exposure has helped many domestic voters realize the disconnect between nativist rhetoric and concrete policy proposals. It has also given mainstream parties time to incorporate Wilders supporters’ more legitimate grievances by shifting their platform. More telling however is the pattern of his poll numbers: outside of elections, Wilders dominates both the news cycle and opinion polls. Provocative statements command a disproportionate share of media attention, painting a binary picture of Geert versus the establishment. As election day closes however, a dozen or so parties become politically relevant and all receive a significant share of attention. Wilders polls numbers plummet in response. The narrative shifts from a dichotomy between the status quo and those who rail against it, to a more nuanced story of a diverse landscape of political opinion. It turns out that many are critical of the incumbents. Contrary to popular belief, most voters are not unreasonable bigots dead-set on completely demolishing the status quo. 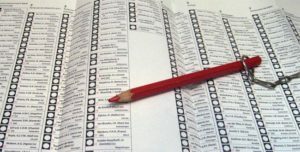 85% of voters will cast their ballot for someone other than Wilders. Before being forced to choose Trump v Cruz or Trump v Hillary, most Republicans did not relish the thought of president Trump. Give them real choice, and voters are more likely than not to be fairly moderate. A great multitude of benefits would accrue to the US, should it adopt proportional representation. It would allow Americans to have a much greater choice than the current ‘pick your poison’ situation, where any vote not for the GOP or Democrats is essentially a wasted vote. Related to this, having a greater number of options dramatically reduces the effectiveness of negative campaigning: when there’s many candidates, it’s harder to prove all of them are no good. The more rewarding strategy is to tell a constructive story and focus on why your policies are such a great idea. Having politicians refrain from excessive mud-slinging might also restore faith in politicians and improve voter turnout: record numbers did not turn out in 2008 to vote against McCain but for Obama. Giving more than two choices should further augment enthusiasm for voting. Proportional representation also ends the cynical situation of candidates campaigning exclusively in battleground states, as the winner of the popular vote would by default win the election: A vote in Texas should be as valuable as a vote in Ohio. Gerrymandering would be a concern of the past too, as it would achieve nothing. The destructive election cycle where policy may be completely reversed every four years would be toned down, as coalition government makes more gradual changes and facilitates long-term policymaking. In short, abandoning majority rule would have ample practical benefits, aside from the moral case for giving minority opinion a fair share of political power. Clearly, the US is not about to abandon its age-old Byzantine electoral system. 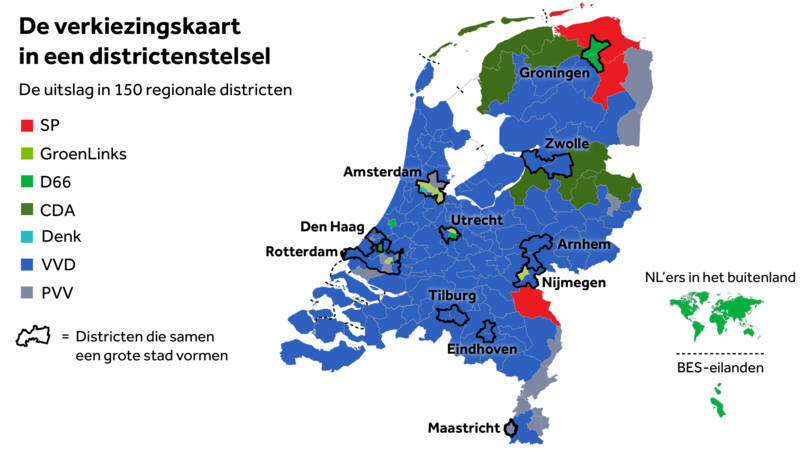 But in this period of political upheaval, it is instructive to consider that neither the Dutch Trump, nor the Dutch Hillary, nor indeed the Dutch Bernie will truly ‘win’ the elections this Wednesday; rather, all views from the far left to the far right will be represented, and may potentially play a role in a coalition government. In order to form a “more perfect union”, start by making democracy more just, and that means making it more proportional. Fri, 10 Mar 2017 in Internationaal, Politiek.